Celine Ferro is a dedicated clarinetist and teacher. She has a growing studio at Southern New Hampshire University, works regularly with the Boston Youth Symphony Orchestra, and has taught master classes at the Boston University Tanglewood Institute. 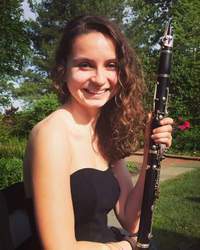 As an active clarinetist in the Greater Boston area, Celine regularly plays with multiple orchestras, chamber groups, and new music ensembles. She has traveled all over the world with her clarinet in hand, performing and teaching in New York City, Canada, China, Rome, Haiti, and the Dominican Republic. She holds a Bachelor of Music from the New England Conservatory as well as a Master of Music from the Boston University College of Fine Arts. When she isn't teaching, performing, or traveling, Celine can be found racing the streets of Boston on her bike, going on epic adventures, or reading James Joyce.